Do you share rides with friends already? Use Jump.in.Jump.out to remove the complex co-ordination process. No need to keep asking…. “Have you left already?”, “Where have you reached?”, “What time are you leaving in the evening?”. Let Jump.in.Jump.out do that for you. Standing on the roadway, fiddling with your phone to keep yourself occupied is a thing of past now! "I want to create a shared trip"
The app detects your current location. Just enter desired destination. Hit "Create Trip" and you are done! "I want to find a shared ride"
Get notified when your ride sharing friends create a shared trip & notify you. You can also look for trips that are relevant to you by touching "Find Jump.In"
Join a trip that you like and track vehicle/driver real-time. Get notified periodically till the vehicle reaches you. Jump.In.Jump.Out addresses the pivotal problems that have held ridesharing back so far. Jump.In.Jump.Out is a platform that is designed to make ridesharing and carpooling so easy that people don't even realize they are doing it! 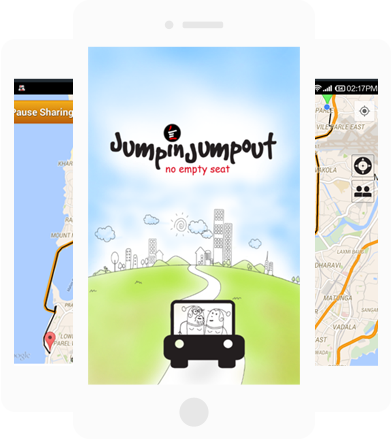 Jump.in.Jump.out is location based and dynamic ridesharing platform. You always see only trips that are relevant to you. The app shows rides passing near you based on your current location. Once you decide to join a ride, you can track the vehicle real-time and get alerted on proximity even when you are not looking at the app. It is deceptively easy. You can create a trip and notify your friends so they can join your trip. The communities make it very easy for people to share a ride with regular commuting buddies. Since the application is notification based, you would not really have to keep the app running. You can always access the app to find rides. Jump.in.Jump.out works on building cluster of people staying and working in same localities. These people come together and form commuting communities. This reduces dependence on a single person and removes the main stumbling block in ridesharing. A community of 25-30 people (friends, colleagues and acquaintances) can easily commute in 8-10 shared cars every day. Thus a single community can contribute to 25% - 30% reduction in traffic. What’s more – The communities have varying privacy settings. “Private” communities allow ridesharing among friends or office colleagues. “Closed” communities work like social groups where the admin can accept or reject a person’s request to join the community. “Open” community, as the name suggests is an open community of ride-sharers. A person can join multiple communities in her cluster to maximize chances of finding a rideshare options. Ridesharing was never so easy! While creating a trip, users can notify their friends and/or communities. Everyone is sent a notification instantly. Users do not need to have the app ON to receive the notification. They can join the trip. From this point onwards, they are regularly notified of the vehicle’s progress. They are notified when the vehicle starts moving, when the vehicle approaches nearetc. The vehicle can be tracked real-time to ensure no-one wastes time waiting on the road. Jump.In.Jump.Out relies on social constructs to ensure that the shared rides are safe. The sharing happens mostly via communities (with varying privacy settings) or between friends. Even when vehicles are shared through open communities, everyone knows who is offering rides. This is already much safer than unorganized and unauthorized sharing that happens on our highways today. When the ride is offered by a commercial driver, his credentials are verified by the system. But Jump.in.Jump.out goes much beyond that.We have built a slew of features focusing on safety alone. The users can set-up emergency contacts that can be notified in case of an emergency. The app includes a panic button & also has provisions to alert the user and her emergency contacts in case of unexpected behavior. Who said you can share only cars using the app? You can easily share an auto-rickshaw or taxi to split costs and save money. Create a trip before venturing out to look for an auto-rickshaw/taxi and notify your community. People going in your direction and looking for auto-rickshaw/taxi can join you. Not only do you save money but you also improve chances of finding an auto-rickshaw/taxi due to sharing. You can also create a ride after getting in an auto-rickshaw/taxi and notify people along the way to split part of the journey. Version 1.10.22 is now available of Google Play. Download it today to start using the “communities”. This is the first version supporting communities and supports only ‘closed’ communities. Community creator can invite people from his/her phonebook to join the community & they become part of it. Users have an option of leaving the community or muting notifications from the community.